Nobody doubts now that India has a rich legacy of glorious traditions: but all thoughtful men are surprised to find they remain yet but a dead letter. Very fine to hear are some of the thoughts and deeds of our ancient progenitors; and to follow them out to their end in practice is of course out of the question with 90 percent of modern Hindus. And the worst of it is, that while the majority confess constitutional weakness and honestly cry quarter, there is now and then a small minority of self complacent and go a head men who would poo-pooh the whole as arrant trash invented by mischief-making brains to keep the common place coward down. Some of these lip-reformers of yesterday making for nothing more substantial than frothy talk are often as contemptible as the quarrelsome fanatics who show more fight to people than God and Religion. And it is a sad misfortune that we now have in our ranks for the most part only men of these diametrically opposite tendencies with whom the golden mean is at best but a chimera not possible of realization in the plane of man's scene of action. Sermons it would appear are now-a-days preached more as a fashion and for entertainment and the Godly are scarcely solicitous to aid their flock in the formation of their spiritual character. Men need to be made sensible that Religion is a personal thing, a matter of personal application and experience. His is but a partial and unsatisfactory faith which is concerned wholly with the state of society in general and allows him to neglect the discipline of his own affections and the culture of his own spiritual nature. Is it a wonder therefore that we sometimes observe and marvel that some of the so called gentlemen of education, who arrogate to themselves the credit of being the depositories of all that is wise in refinement, delicacy, and virtuous principle in this country of ours should often scandalously forget themselves or rather willfully act in a manner that gives the lie to all their presumptuous boastings. But the consolation, if it is one at all, is that India has been no single and glaring exception. History reveals as a demonstrable fact that intemperance, debauchery and crime have not and then desecrated the homes of the Godly to whose sniveling's, whining's and lugubrious lamentations the sacred halls of Jewish had echoed invariably. Religions then is much too often mistaken for its very opposite Irreligion and vice versa. Hinduism – Aryanism – Siddhanta – Vedanta – or even better – the Vedanta-Siddhanta as it is often expressed has suffered much at the hands of those who would seem to profess it today, not that our Religion has become degenerated; but it is a sure sign now that all Hindus as a nation have for long been blindly galloping towards rain and annihilation. The srutis, it would appear, begin with teaching ahimsa and end in taking us to total self-abnegation or our only goal – selflessness. Non-injuring any living ting, aforliari non-killing the lowest form of life in God's creation on any account are the mottos that are blazoned on any and every banner claiming to be Hindu however widely they may differ one from another in minor details of dogmas and rituals. Hindu Ethics itself is based on this Divine Law or command and the Hindu believes that no salvation is attainable by one who is a perfect stranger to all Jeeva Karunya. Of course it is very comfortable to believe in a God who gave the animal for man as his food. As well might the tiger argue from his own standpoint that his God made man as his food. The argument answers both ways surely. But the humble Hindu does not understand the logic in it. His glory is to be perfectly innocent of the life (flesh and blood) of any living thing however low its manifestation might be. Non-killing is his watchword, he would therefore avoid altogether fattening on beef and pork and such pleasant things. But even that does not exhaust his idea of Ahimsa altogether. Sometimes a feeling or a sensation would kill with the fire of a thunderbolt in much less time than a dagger or an arrow would. He must accordingly exercise constantly what he calls Jeeva Karunya, the only anodyne to all evils humanity is heir to. This would no doubt involve bearing and forbearing on his part, no small amount of self-sacrifice as it is called. And it is in such self-sacrifice that Religion begins for him and ends when he attains to the supreme knowledge that he is not his little body. Having premised thus for, we shall now proceed to translate the treatise in Tamil on "கொலைமறுத்தல்"
by திருத்துறையூர் சாந்தலிங்க சுவாமிகள் only remarking enpassant that we shall only be able to treat our readers to a short history of the life and various works of our sacred author at a future date before we shall have rendered the whole work, into the Lingua Franca of the modern civilized world. (a) Plain. – I bow in adoration to the elephant Vinayaka Deva who was born to Shiva of Sakti to help virtue and good and destroy sin and evil in the world of man. (b) Philosophical. – Salutations to Sat-Chit-Ananda (Pranava Roopy) in whom ignorance or avidya is nowhere and ananda ever inherent as Swaroopa. Vinayaka, One above whom there is none: or Him beyond whom there is no beyond or That which itself uncaused is yet the cause of all causes. Aum! The Pranava is the life and soul of all existence. The Vedas never begin or end anything without first pronouncing this Mantra – the holy of holies. Vedic Ritualism. No Karma would bear any fruit unless Ganesa is to begin with invoked and installed as the presiding deity over it. 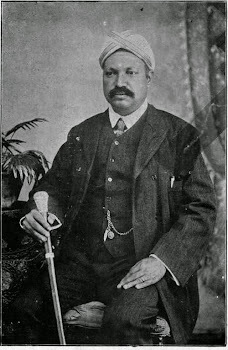 V. MUTHUCUMARASWAMY MUDALIAR, B. A.